When selecting a concrete cutting saw, you're searching for a powerful motor, strong blade and machinery created by a trustworthy brand name. Whether you need a gas-powered cut off saw or prefer an electric-powered tool, this collection of saws will deliver the quality you need at prices you can afford. 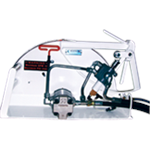 In addition to a collection of gas and electric concrete cutting saws that will fit into virtually any budget, shop for hydraulic hand saws or ring saws. Select your saw according to the specific projects you need to complete. If your projects require you to cut through concrete, metal and other hard surfaces on a routine basis, then you may need to pick up a variety of hand saws suitable for different projects. If you don't cut hard surfaces too often, one good saw may suit your needs. Once you select the concrete cutting machine suitable to your needs, select from a variety of cut-off saw accessories. A cart will turn your handheld saw into a walk-behind saw, allowing you to complete more projects while making just one financial investment. You may also stock up on oil if you decide to purchase an oil-powered saw.